Ibiza Beats Volume 10 is a stylish and elegant selection of melodious songs combined with great voices. The SUNSET CHILL compilation starts with two very beautiful smooth alternative chill “You Take My Breath Away” featuring Sura Q-Zick produced by Kaxamalka and Heart & Soul by Musicmania, arranged and produced by Marco Moli followed by a downtempo that earned the privilege of the very sensual voice of Chico Taylor performing “Outrolude” and “No No No” by DJ Deviance that fits perfectly in the suite, just before the sweet and charming original track “Underwater” featuring Anna Prokop produced by Lee & Sun (Nico Rein and Julian Kelm) and the pure chill out beat “Cala Massimass” by Pat Lezizmo. Marco Moli comes back featuring Petra Jordan’s “From the Other Side”. And the compilation is slowly coming to the end with “Rivers” by DJ Deviance and “Deja Vu” performs by Airily before and this landscape musical journey is closed with “Down the Path” by Kusuma Orchestra. The BEACH LOUNGE compilation starts exquisitely with Almadrava vocals whose name are Patricia Leading & Pedro Toro performing “The Way” followed by an instrumental of freestyle guitar cords by Taco Town featuring “Acerado” and “Perfect Kind Of Love” performed by Musicmania, arranged and produced by Marco Moli. “Once Again” written and produced by Clelia Felix. The sweet spanish vocals “Distancia del mar” by Almadrava. “Relax in Sura” by The Sura Quintet. “Walk on the Wildside” by Coco M performing the vocals from a chillmix by Marc Hartman original produced by Jacques Swart and Marc Hartman by Lou Reed, “Sierra del queer” by Pat Lezizmo, the chill remix by Musicmania “This is Me” with Christine Joan Johnson (andrea Felli) at the vocals. “Shoot Me Down” produced by Katoey. And the end is coming with “It’s in the groove” by Musicmania, arrange and produced by Marco Moli and “Unreal Visions” written and produced by Clelia Felix. 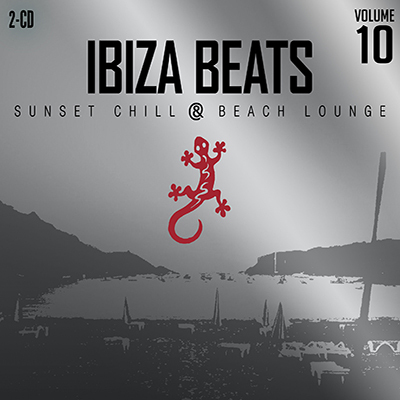 This ‘Silver Edition’of the compilation series Ibiza Beats ‘Sunset Chill & Beach Lounge’ means 10 years of high quality chillout music! The Ibiza Beats compilations are nowdays a wellknown brand in the world of chill and downtempo music. Relax and enjoy the new and exclusive new titles on this ‘Silver Edition’ of Ibiza Beats!